Lily Gandhi moves the ball. 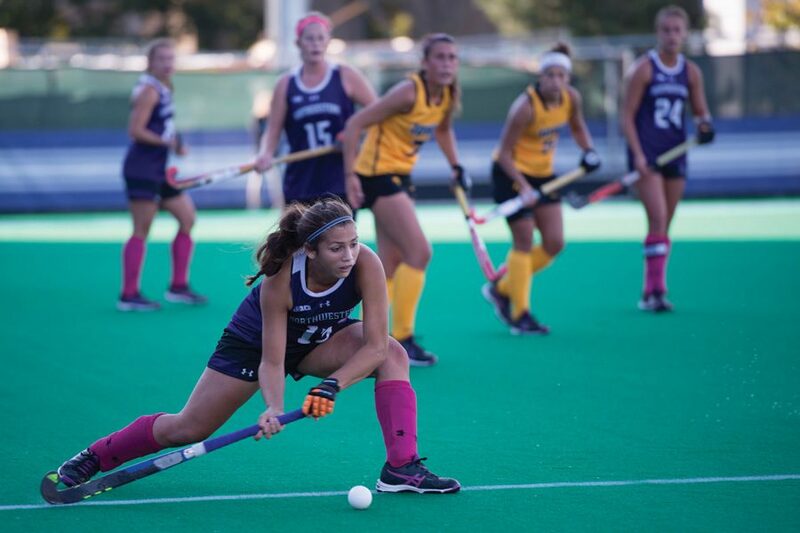 The freshman back and Northwestern travel to Michigan this weekend to play their final Big Ten game of the season Friday against Michigan State. When No. 10 Northwestern hammered an overwhelmed Central Michigan team 8-0 on Sunday, it didn’t push the the squad up the Big Ten standings. But it did have intangible value. “We definitely are a team that goes off momentum, so it’s going to be really important to get the win on Friday,” junior midfielder Elena Curley said. NU thrived on momentum early in the season, knocking off then-No. 4 Penn State and then-No. 6 Maryland less than 48 hours apart. Those games came in the midst of an eight-game winning streak that pushed the Cats as high as No. 6 in the country. In recent weeks, however, NU’s fortunes have changed dramatically. Unranked Indiana snapped the Cats’ lengthy winning streak Oct. 7, and two days later then-No. 8 Louisville handed NU its first shutout since 2014. Next, consecutive home overtime losses to a pair of ranked teams — Iowa and Michigan — extended the Cats’ losing streak to four. NU had opportunities to win each of the four games it lost and was never blown off the field. Against Indiana, for example, the Cats had 12 shots on goal to the Hoosiers’ seven. After scoring at least three goals in every game of the winning streak, NU did not hit that number at any point during the losing skid. Because of that, coach Tracey Fuchs said offensive execution has been a focus. The Cats’ keys to success go beyond tactical adjustments, however. For example, Curley said the team realizes it must pick up its work rate to once again be successful in its Big Ten finale. Fuchs, meanwhile, highlighted her team’s unity and ability to keep its emotions in check. Though Saturday’s game against Stanford will simply offer NU an opportunity to enter next week’s Big Ten Tournament on a high note, Friday’s contest against Michigan State has significant implications for tournament seeding. The Cats could be as high as the No. 2 seed with a win, depending on other results, and drop as low as No. 7 with a loss. Fuchs said playing for seeding is important, but added that to win the conference tournament, NU would need to beat several top teams regardless of its seed. Massey, on the other hand, did not downplay the significance of Friday’s game.